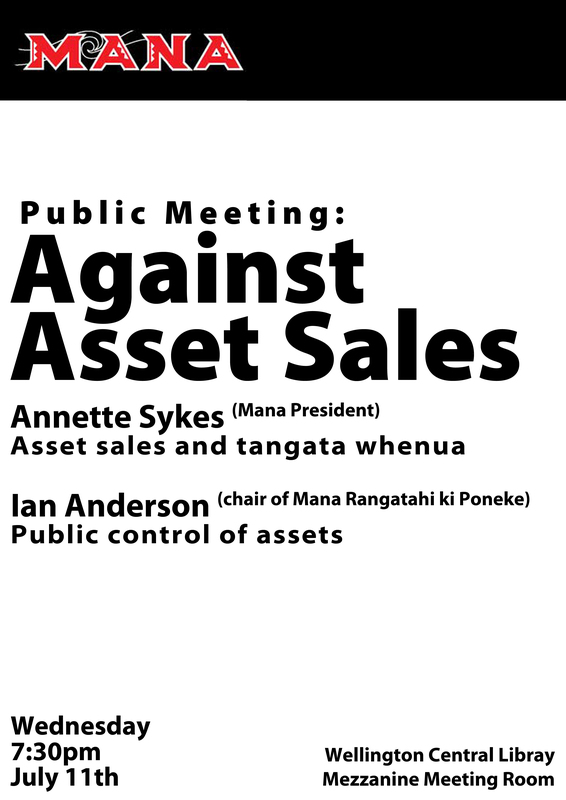 Asset sales legislation has passed despite opposition from some 80% of those polled, and up to 88% of tangata whenua. Kai and korero on the fightback at Wellington Library Mezzanine. are they opposed to the sale of the assets from state to public or from state to people who are not themselves? If these assets were used to settle treaty claims would they fight this? If it is found that the water is owned by various tribes and to meet their ideology the national government give 50% to the owners of the water and then sell the other 50% to the market would there be as much opposition (from maori not non maori). As some Maori corporations supported slavery at sea I can’t see them being to moralistic about profiting from water if they can. I’ll be interviewing Sykes on the topic for The Spark, but yeah she definitely does not support shares as a solution to Maori grievances. Mana is in part a split away from that corporatism. In terms of why 88% oppose sales, Maori are still on average in a worse situation than Pakeha due to colonisation and neoliberalism. Privatisation hits Maori particularly hard, even when iwi corporates get a few shares.